What would I be, if God wanted me to be something different? I would be whatever God saw fit to make me. I would be a crow picking at the bones of the dead. I would be a worm nestled in the heart of my enemies. I would be a faceless angel. I would be a rabid wolf. I would be a broken mirror. But make no mistake, my children. Whatever God sees fit for me, one thing will never change. I will always be a monster. • An unholy host of alternate systems for you to option into your characters and games, including (but not limited to!) Morality, Virtue/Vice, Merits, character creation. • Brand new systems for you to incorporate: social and mental combat, miniatures combat, relationships and Rapport, Conviction, Insanity, and don't forget to check out the Extraordinary Mortals template (with built-in Skill Tricks). 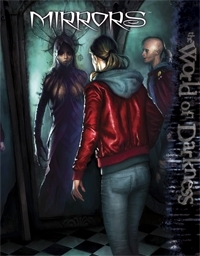 • Three new "what-if setting hacks" for the World of Darkness. The World of Darkness Revealed, wherein the monsters stand exposed for all humanity to see; The World of Darkness Destroyed, which gives you the option of playing out the global apocalypse; and The World of Dark Fantasy, a fantastical spin on the system and setting. • A handful of essays from the writers and developer of the book, bringing you their own personal "house rules" and hacks for you to consider. For use with the World of Darkness rulebook. Anyone else have a problem with the soft cover print? Mine was printed with the pages in reverse order. This title was added to our catalog on July 19, 2010.